Nakhane Touré is a restless soul on a mission to make sense of the world with his songs. You can hear his whirring mind in his bewitching lyrics, which ask more questions than they answer. In his high, haunting vocals, you’ll hear an artist not afraid to expose himself. And in the vast range of styles that come naturally to Touré, you’ll find a young man who makes music not for fame, but because it is the best way he knows to express his emotions. That the 25 year old raised predominately in Port Elizabeth, now based in Johannesburg, has called his debut album Brave Confusion makes perfect sense. His mesmerising, 21st century folk owes as much to traditional African music as it does to recent Western rock, ‘60s soul and ‘70s jazz. He may have taken the name Touré in homage to his idol Ali Farka Touré, but he is as likely to cite Morrissey, Nina Simone, Black Flag or Radiohead as influences. And he’ll as often pluck the strings of an acoustic guitar as play electric rock riffs or slinky, Prince-style funk. The title Brave Confusion in fact comes from a line in one of Touré’s favourite novels, James Baldwin’s Go Tell It On The Mountain. The 1950s novel’s Biblical references may also have been an influence. Touré’s strong Christian roots rear their head not only in his subject matter, but also in his meticulous, often old-fashioned phrasing. “Put aside the spiritual side of the bible and it is a great piece of literature,” enthuses Touré. “It’s incredibly poetic – it inspired how I write, particularly my sentence structures. And it taught me to take lyrics seriously. Touré knew he could sing at the age of six, when he was given his first solo at a Christmas Carol event attended by his musical mother, aunt and many cousins. He accompanied his family who took part in choral competitions, travelling to Jo’burg and Cape Town. 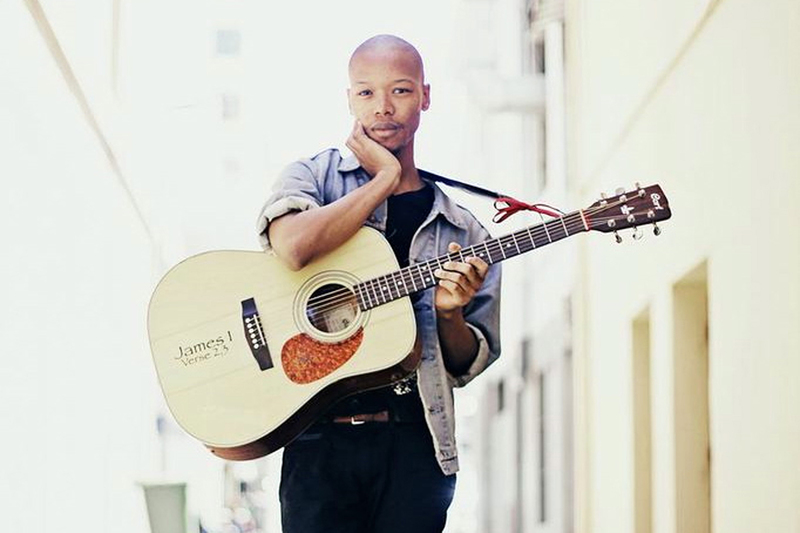 Keen to play instruments, Nakhane took up trombone at the age of ten. Touré took up marimbas, drums and percussion and when the school bought some steel drums, joined his first band. So dedicated were the drummers, they chose tricky pieces to play and skipped P.E. to practice. When Touré was 14, his school group was chosen to travel to London to perform at the Notting Hill Carnival. By 15, Touré knew he wanted to make music a career, but had no idea how. When South Africa launched its own version of Pop Idol, he applied – three times. So devastated was Touré by the repeated rejections that he abandoned music for 12 months, believing he didn’t have the talent to succeed. Instead he took up acting in high school, which soon led him back to where he belonged. His passion reignited, Touré began raiding his mum’s record collection, which led him to Marvin Gaye, The O’Jays, Weather Report among many others. He discovered he had a distinctive voice and began to think about his own identity. At 19, he took up guitar, but wasn’t sure whether to go electric or acoustic. Then, on the internet one day, he heard Radiohead’s In Rainbows. Touré listened to the sounds synthesising in his head and found the confidence to go with what felt right for him. He didn’t want to follow trends or be part of a scene. He didn’t care about being cool. He set out to make songs with spirit that summed up his own life. At the age of 21, he wrote In The Dark Room, the first song he was truly happy with. But still it wasn’t plain sailing. He continued to write and began playing in a punk band while at university studying literature. Two and a half years ago, he ran out of funds to continue his studies. With nothing to lose, he picked up his guitar and, for the first time, started playing solo gigs by night while working in a book store by day. For 18 months, no one noticed. On the verge of giving up, he got interest from a record label. Last year, after a gig at Oppikoppi, South Africa’s largest festival, he finally signed a deal. In November, Touré went in to the studio with producer Matthew Fink to record acoustic demos. His first release, earlier this year, was the Abraham EP , which included the original track Abraham as well as four covers including tracks by Radiohead, Patti Smith, Hercules & The Love Affair as well as a torch song cover of The Cure’s Just Like Heaven. Touré continued to write songs, including the glorious Christopher, his most upbeat song to date and the first single released from Brave Confusion, an album that effortlessly blends more styles of music than should make sense, but could only have come from one man’s mind. Touré plays guitar, bass, keys, melodica and percussion on the album; Fink contributed keys and some guitar. Strings were provided by Waldo Luc Alexander and drummer, Tshepang Ramoba from BLK JKS , a hero of Touré’s, who came along to play drums.